Tim Burton’s 1999 re-imagining of the timeless tale of the Headless Horseman is one of my favorite films. Especially for Halloween. It beguiled audiences with its gorgeous visuals. A bracing bit of grit gave darkly lush sets tactile presence. The screenplay is more mystery than horror, albeit set in a world of witches and demons. The story revolves around a man of science, a non-believer, investigating that world. What do you believe in? …Sense and reason. Cause and consequence. 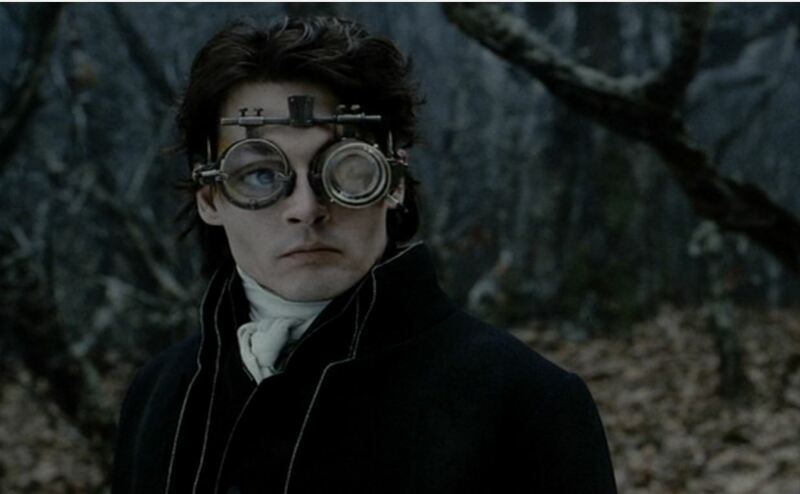 Sleepy Hollow gave us perhaps the only example in all of cinema of a realistic character portrayal of a scientific investigator tackling the supernatural. It’s done so brilliantly that there are some good lessons in skepticism that bear attention. Usually, a protagonist experiencing the paranormal acts like a fool for the convenience of the screenplay. Even when the supernatural events are happening constantly, they never alert the national media, for example (e.g. Poltergeist, Insidious, It Follows, Oculus). Often, they don’t even try to flee. In Paranormal Activity, the prot realizes there is a ghost with violent tendencies in his house. His plan is then to get cameras and go about his business. You know, the rational thing to do when there’s an unstoppable malevolent entity in your home. Even characters who are scientists act like imbeciles. Agent Scully of the X-Files franchise is an FBI agent and medical doctor. She witnessed numerous things that were clearly beyond the pale. Yet she continued to deny those things exist, she denied her own experiences. It’s as if the writer thought that being a rational investigator means that you don’t believe anything that there isn’t hard evidence for, even things you’ve seen yourself! This makes Scully into the True Believer. She doggedly refuses to let go of her preconceived notions in spite of the evidence, while Mulder updates his knowledge based on new information, regardless of whether it is publishable or not. Sleepy Hollow is a rare, if not the only, exception to this pattern in a horror setting. 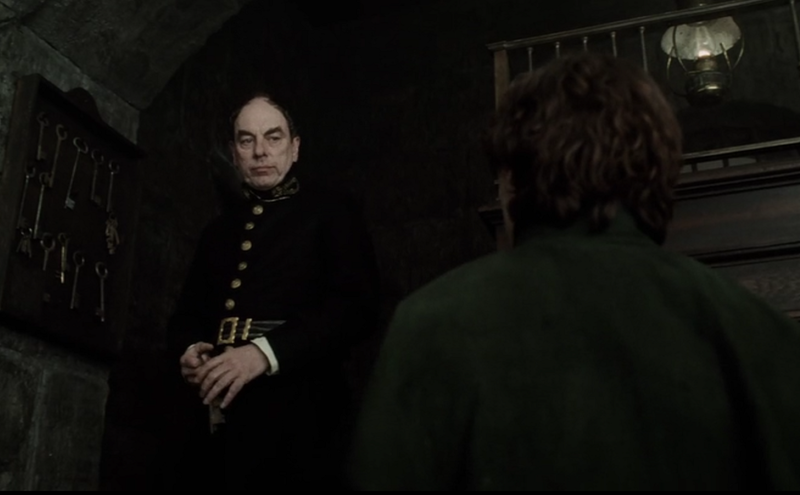 In Burton’s movie, Ichabod is a police investigator with a scientific bent. “Bad” characters often have a mantle of white or veneer of goodness; “Good” characters are often shrouded in shadow. Other visuals represent illusion, misdirection, and the elusive nature of evidence. Left: The shadow of the bird/cage thaumatrope falls on young Ichabod’s eye. Right: The toy casting shadows on the wall spins, just like the thaumatrope, Ichabod’s mother, and Katrina; both of whom also draw spirals. Mid-Right: Brom pretended to be the horseman, fooling both Ichabod and the audience. The sergeant looms over Crane. This is important because when Ichabod begins investigating a ghost, he does not believe what the residents tell him. He scoffs initially, but he nonetheless resolves to do his best and takes seriously what the people have to tell him. Indeed, when a town official tells him that he need only “this book”, before plopping down a heavy Bible, he does so immediately. He opens the cover and sees a family tree showing that the two families are closely related, an important clue. For a skeptical investigator, it is important to take people seriously and treat them with respect, even if you think they’re wrong. Ichabod’s experience being dismissed may have granted him a measure of empathy. We later learn that his mother was executed as a witch by his Bible-thumping father. Ichabod’s devotion to forensic science and finding the murderer stem from his commitment to justice. Scientific research, skepticism, and criminal investigation must not be sterile or self-serving pursuits, but ultimately public goods that serve the interests of people. In most supernatural thrillers, the supernatural elements can only be addressed in-kind with other supernatural devices. A demon must be exorcised, a curse unmade via magic rituals. Sleepy Hollow, refreshingly, does not take this tack (something it has in common with another great film, Ghostbusters). Ichabod unravels the mystery with ordinary sleuthing, for the most part. Were there real ghosts or other claimed entities, this would remain true in the real world. The movie shows exactly why. It shows how powerful the tools and methods of the investigator are, even when assumptions are violated, and senses are deceived. Ichabod says this to Katrina, explaining the bird/cage illusion. In other words, our senses can lie to us. Fortunately, we have more to work with than mere eyes and ears etc., and senses can deceive, but not infinitely so. Every illusion may be pierced. Ichabod overcomes the deception and illusion around him by being a careful observer. He leans on the reliable that tools he has: knowledge of psychology, politics, and physical evidence. He considers who has the most to gain from the murders. He discovers a wound was made post-mortem, revealing a conspiracy. All claims of the paranormal and quackery that I am aware of would also leave physical evidence. Ghosts that can move things can be caught on camera. Ghosts that can bounce photons onto retinas can do the same for cameras. Mythic beasts still need to be part of ecosystems, need to eat, and like all things, leave corpses when they die. Things such as psychics, prophecy, and telepathy should be trivially easy to prove. In Sleepy Hollow, things that commonly mark moral valence are ambiguous. The character Katrina often wears white and light colors and appears kind and sweet. But she also dabbles in witchcraft, leading Ichabod to suspect the worst. The film’s visuals offer clues to the viewer about how this is to be resolved. In this scene, Ichabod does not know who is on the horse; the figure is shrouded in a silvery-grey cloak (note that it is neither black nor white). But a moment later, it is revealed to be Katrina. The cloak has color after all: red flowers— but only on the inside. The design clues you in that she is not evil, in spite of superficial appearances. In the autumnal, blue-tinted Sleepy world, bright color is rarely seen in the film. Here it recalls the color of the cardinal that Katrina admired as “her favorite” earlier. This references the real bird and also the bird on the thaumatrope that is frequently symbolically linked to Katrina. I am pinioned by a chain of reasoning! 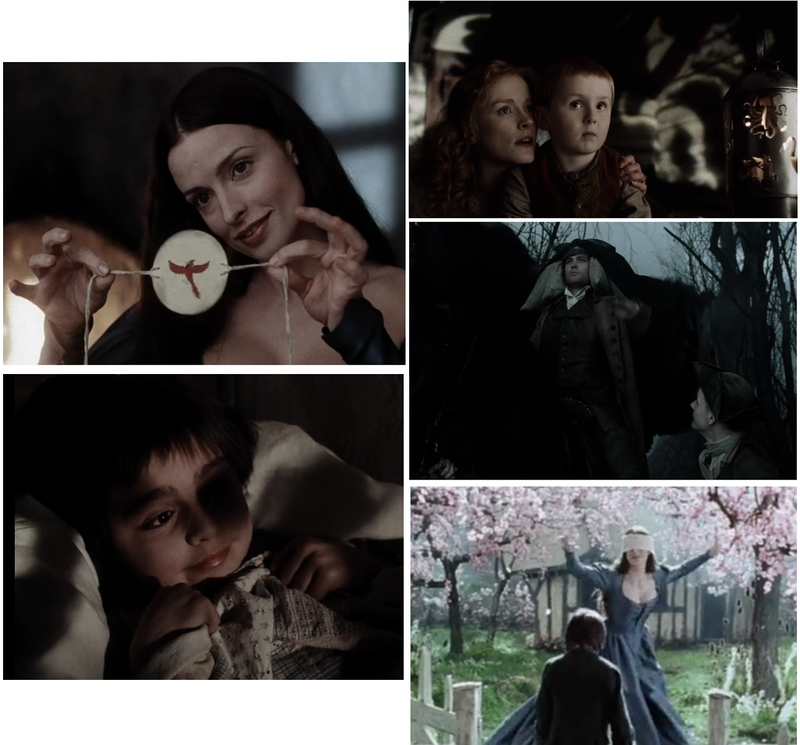 Throughout the movie, we see that witches may be good or evil. Police, magistrates, and reverends can be corrupt. We often can’t tell right away who or what is good or bad. Biases are like that, too. We tend to think of biases as singularly bad; something to purge. But this is nonsense. A bias is a guiding assumption, and we need them to do anything useful or good in the world. 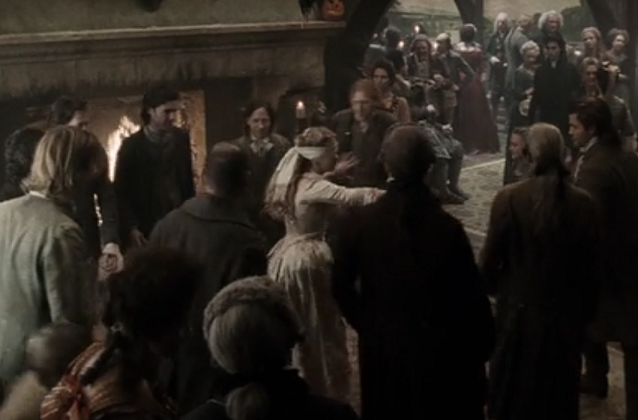 Ichabod begins with naturalistic biases that there are no ghouls, and that witchcraft is generally bad. In his universe, these turned out to be false and lead him astray. But he had many other biases that allowed him to succeeded. He assumed that a killer must have a motive; a purpose. He assumed medical facts applied, even in this setting, leading him to critical clues. He never abandoned his basic forensic mode of inquiry— itself a set of biases. We need biases our biases. They are only negative when they fail us. Then they must be mended or replaced. To do that, you need something else. Ichabod’s life is in danger and after an encounter with the horseman, he was ready to bolt. He relived the murder of his mother in a dream recollection. The injustice of her death restored his resolve to stop the killings in Sleepy Hollow. In reality, we will not face such dangers, of course. But Ichabod has several struggles of a sort we can relate with. In the first act, he risks his career and reputation in his fight for greater justice. Later, he struggles with his own worldview, shaken by new realizations. He loses confidence. He is sometimes unsure whom to trust. [to Ichabod] You are bewitched by reason. I am beaten down by it! …villainy wears many masks. None so dangerous as the mask of virtue. Ichabod was ultimately able to change his views in the face of the evidence. Some ideas are so deeply held that we begin to associate them with our identity. Altering those is painful, an ordeal. The inability to reconsider cherished notions has done more harm to humanity than an army of murderous ghosts ever could. Mr. Clint, I am sorry to post off-topic but I read that you founded this website so I am pleading with you to reconsider the inflammatory and highly bigoted posts by the one called The Prussian. I am not sure how much you read your coblogger’s posts but I hope you are also not a Muslim-bashing right-wing fanatic. If you really want this blog to stand apart from the hate why tolerate such hate on your own site? He continually cites conservative websites that are filled with horrible and untrue slanders against an entire group of people, making no distinction whatsoever between the good guys and the bad. Isn’t that an example of bigotry? Why do you tolerate it? He actually wanted Donald Trump to win. Are you a liberal? Do you support Trump? What kind of lunatic would support Trump???!!! And now that we see how he wasn’t so liberal, so anti-establishment after all The Prussian has egg all over his face. That tells you alot about this persons objectivity. Please reconsider having this person on board. I do not see how he or she helps your cause if your mission is an all inclusive place where skepticism is defended and liberal values are spread. Prussian is the antithesis of those values. Would you agree or disagree?